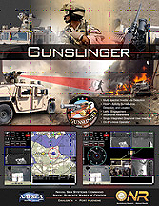 The Gunslinger Project is the spiral development of a multi-spectral, on-the-move hostile fire detection and counter fire system that provides mobile ground forces in operational environments with real-time and precise location of hostile direct fire as well as the ability to engage the source of the hostile fire in near-real time. As the Gunslinger Lead Systems Integrator, Naval Surface Warfare Center, Dahlgren Division has successfully integrated an electro-optical infrared detection system, an acoustic detection system, a stabilized gun mount, and a Situational Awareness (SA) video system as the primary components. These sensors and weapon system have also been integrated with navigation and communication systems to track event detections while “on-the-move” and to relay information about those events using either satellite or Wireless Local Area Network (WLAN) communications. Managed by the Officeof Naval Research, Code 30, Maneuver Thrust Area, Gunslinger is a joint project between the Army, Navy, and Marine Corps along with several government laboratories and industry partners, working together to develop a hostile-fire detection and counter-fire system which is militarily relevant and has a high degree of military utility. Gunslinger has recently completed a six month tour in Iraq where it participated in over a thousand missions and was used to provide overwatch surveillance at Al Asad and street patrols in Fallujah. Today’s U.S. military faces a wide array of challenges in diverse operating environments and postures around the world. Traditional kinetic weapons are often of limited value in peacekeeping missions and in urban environments with restricted engagement options, or can simply be too costly or ineffective to employ against asymmetric threats. Directed Energy (DE) offers the promise of unique and flexible options to address many of the challenges presented to our war fighters and to augment, not replace conventional capabilities. 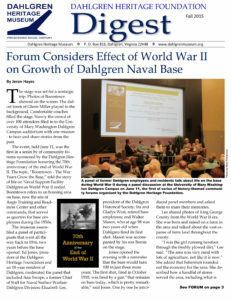 Recent developments by teams of scientists and engineers at the Naval Surface Warfare Center Dahlgren Division (NSWCDD) in High Energy Laser (HEL), High Power Microwave (HPM), and Counter-Improvised Explosive Device (CIED) prototype systems have demonstrated military utility in the laboratory, in field exercises at DoD test ranges, and in operational deployments. Recognizing that DE technologies are ready to transition to war fighting capabilities, NSWCDD has committed to expanding its leadership role for DE by chartering the Directed Energy Warfare Office (DEWO).